HUNTLY, Scotland, April 2, 2019 /PRNewswire/ -- It's not every day that a 19-year old gets to race a Lamborghini, but Sandy Mitchell from Forfar is doing that on a regular basis. The Lamborghini Super Trofeo North American Championship is an intense, high-speed six-round race fought out on a number of America's iconic racetracks, including Road America and Laguna Seca. The season gets underway this weekend (April 5-7) at Barber Motorsports Park in Alabama, before heading to Watkins Glen in June. 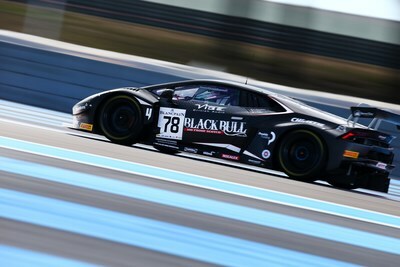 After that, he will head back into the Blancpain Endurance Cup at Monza on 13th and 14th April, driving for the Black Bull Barwell Racing Team. Competing in two different Lamborghini Squadra Corsa cars will test the limit of the young racing driver but he's well prepared. "I know the Lamborghini really well having driven for the Black Bull Barwell Racing Team last year and so I know how to handle it." said Sandy, "The car in the Trofeo Championship is different, but I've been out there testing it with the Wayne Taylor Racing team and feel confident that I can produce race winning pace from the start." Chairman of sponsors, Black Bull Scotch Whisky, Euan Shand commented; "We've sponsored Sandy long before he could legally drive on the road. Aged 15, we saw Sandy's potential and we have backed his racing career since then. We think Sandy has the ability to reach the ultimate prize which is Le Mans and the European and American platforms he will race in this year prepares him beautifully for that opportunity." Mitchell, a race winner in both Blancpain and British GT championships, is part of the Lamborghini Squadra Corse GT3 Junior Program and a member of the prestigious British Racing Drivers' Club Rising Star scheme. "This is a fantastic opportunity to further my career, and I have to thank both Black Bull Whisky and Wayne Taylor Racing, plus Prestige Performance, for the opportunity," Mitchell said. "I felt it was important this year to increase my seat time in a competitive environment, and to be able to race in one of the highest-profile championships in America will significantly develop my experience."